Fonterra Brands Sri Lanka can now meet demand for an extra 10 million servings of locally-sourced Anchor Newdale yoghurt each month, with the investment in its second state-of-the-art Rs. 450 million form-fill-seal (FFS) machine. The dairy co-operative said the high-tech FFS machine will enable the company to produce 125 per cent more yoghurt than its previous capacity, re-energising the appetite for fresh dairy nutrition. Managing Director of Fonterra Brands Sri Lanka and the Indian Subcontinent, Sunil Sethi said this investment is the latest in the company’s Rs. 10 billion commitment to boost the nation’s dairy industry. “Sri Lankans are looking for a wider range of product formats, increasingly in the form of yoghurts and liquid milk. This latest upgrade adds even more impetus to the yoghurt market and is part of our relentless pursuit to empower the local industry to meet the nutritional needs of Sri Lankans. “As Sri Lankans seek more yoghurt, this equipment will enable us to collect even more milk from local farming families and further strengthen the industry. It also complements our efforts to increase local supply through expanding our network of milk chilling centres, increasing the productivity of farmers through training and development, and innovating through research and technology,” said Mr Sethi. 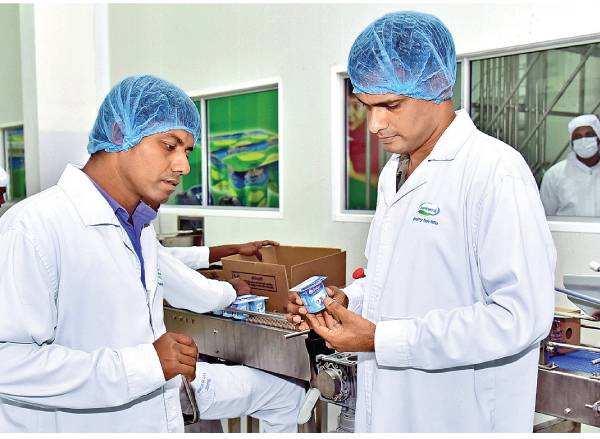 Fonterra Brands Sri Lanka Head of Manufacturing, Suneth Kotuthenne, said this latest investment will allow Fonterra to continue to provide high-quality, nutritious dairy solutions for Sri Lankans across all life stages. “Food safety and quality is a top priority at Fonterra. This new machine requires minimum human involvement throughout the production process, ensuring the highest level of hygienic standards and compliance with local and global food safety and quality requirements. ”Fully automated, the new equipment carries out the entire process of packing Anchor Newdale yoghurts – from forming the yoghurt cups, labelling the cups, filling with product and sealing the package.It also provides the capability to manufacture innovative product offerings which we plan to introduce in the near future. “Not only are our yoghurts top quality, they are packed with nutrition and can be enjoyed as a delicious and healthy snack as part of every child’ sdaily dairy serving,” said Kotuthenne.